It's time special time of year once again, Christmas! 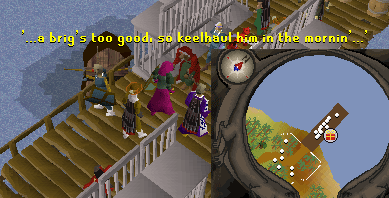 Everybody has come into their holiday joy, and so are the people of RuneScape. 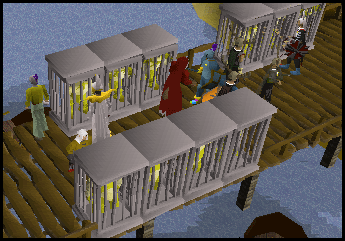 In Lumbridge they celebrate, all the way to the vast lands of the Gnome Stronghold. But back in Karamja, it has started snowing and Shanty Claws is not in a good mood. The Gublinch have been doing some naughty things! Note: This event was only available from 19 December 2006 until 4 January 2007. Speak to Shanty Claws on the Musa Point docks. 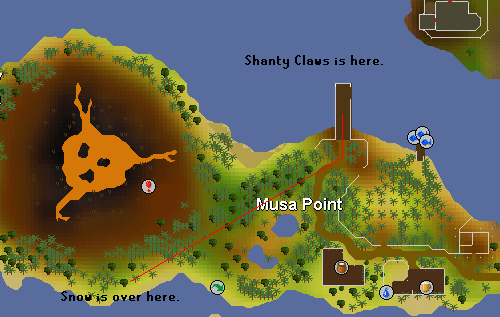 Take a boat to Karamja and go to the Musa Point docks. There you will find the one and only, broad Shanty Claws. He is not in his regular act though, he seems to be mad. He will give a descriptive rundown of what has happened, in his own unique way... He says that the Gublinch have stolen three Karamjan Children! They are in a cave, to be protected from the snow they hate. You are to get snowballs, turn them into pieces of rocks, and insert them into the cages. 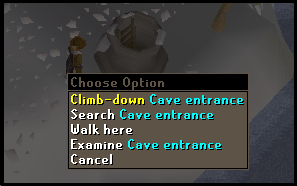 To get the snowballs, go southwest of Shanty Claws to a snowy area. Their will be little hills of snow, click on it to collect snowballs. You will get 3 snowballs for each grab. Also, get at least 30-35 snowballs just incase you miss. After that, you will enter the cave and see them. You will see the children working. Yes a sad sight, but that's why you are there, to help! Continue to get the shards, throw the snowballs you got from above. At first you might miss but your character will keep trying. It takes 3 hits to kill every Gublinch. After every hit, the monster will turn a different shade, until it dies. Note: When throwing snowballs, if another character throws his/her's and it falls, yours is not affected. Get at least 10 shards (this is the amount of cages there are) and your ready to go! 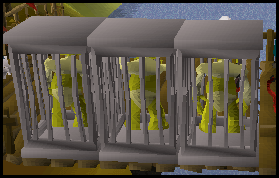 Head back to Shanty Claws and put all of the shards into cages. They will come back to life when placed inside. Shanty Claws will be overjoyed by the sight and as he promised, your wonderful Christmas gifts. Note: The tree is members only. He wishes you a Merry Christmas, and a Happy New Year! Now you have two new items in your possession. 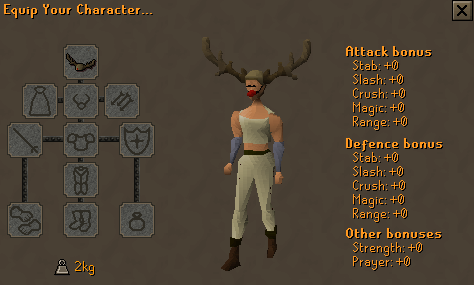 Antlers with a decorative nose, and a tree for your very own Player-Owned-House. These items are very special. If you ever are in the time when you lose them, just go to Diango for a replace/another pair. The hat as a special emote, to activate, click the operate option on your screen. You can also plant your tree in your house. Note: Must be in garden and nothing must be in that place. 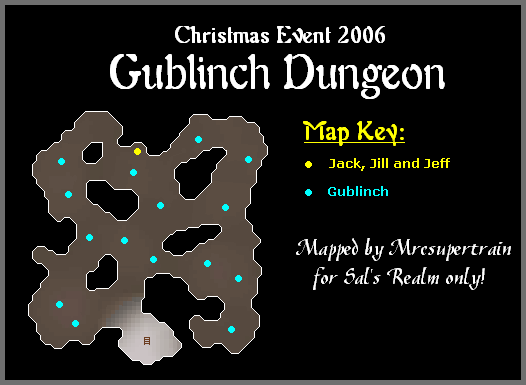 Merry Christmas to everyone, and have a Happy New Years from all of us here at Sal's and RuneScape!